Buy it and they will come: In late 2016, we purchased a Mold-Man® 8000 low-pressure thermoplastic molding machine. This low-pressure molding machine will enable us to help our customers with time-to-market molding options, improving initial designs and optics. We started out working on a few low-pressure molding projects with customers. Our customers’ concepts were great, but the packaging was laboratory grade. Enter Fourstar and low-pressure, low-temperature, quick-turn molding. Our customers trusted us to put our 30 years of cabling, manufacturing, and molding experience to work on making things better for them. Start small, think big: Our marching orders were to under commit and over deliver. Since inception, we have been working on material supply chain, tooling partners, and design-for- manufacturability (DFM) methods to ensure our customers were not disappointed once we turned this thing on. That was a good move, because we are finding a great deal of interest and orders due to this approach. It has set us up to be ready when the time comes to shoot plastic in a shape and configuration that accentuates our customers’ product offerings. Low on pressure, high on results: Our successes have been numerous and applications varied. To date, we have worked on PCB encapsulation for harsh environments, over-molding of non-traditional large- and small-format open-barrel contact connectors, Y and T connections, and custom strain reliefs. Give us your design concept or CAD files for review and quote (week 1). We’ll build or model a prototype mold and product sample ultra-fast for evaluation (week 2). *Based on a single-cavity aluminum over-mold tool. Until then, bring it on: We invite you to put the pressure on us so we can take the pressure off you. 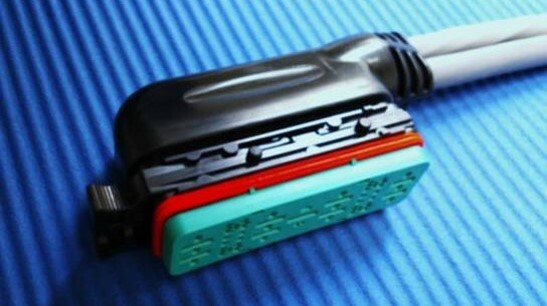 Is a fast and efficient direct part, or over-molding process, using hot melt polyamide and polyolifin plastics. Achieves exceptional sealing and protection of mechanical, electrical, and telecommunications components with higher productivity compared to those materials widely used in current sealing processes: e.g., two-component casting/potting resins or silicones. Is environmentally responsible and contributes to total cost reduction due to improved productivity and reduced waste. Protects your products against dust, moisture, strain, vibration, impact, and damage. Allows for more precise molding on unsealed connectors and open and exposed components. You will have total adjacency support to your low-pressure over-molding needs with our other core capabilities, which include (and are not limited to) cable/harness design and manufacture, prototype and production box build, expert new design and new product introduction (NPI) services, reshoring and near-shoring proficiency, and Kanban program management. Fourstar Connections partners with leading companies to “find a better way” for time to market, new product introduction, and design for manufacturing initiatives. How can we find a better way for you? Contact us to find out how.